In Star Trek [Deck Building Game]: The Next Generation – The Next Phase – a standalone game that can also be used as an expansion for Star Trek [Deck Building Game]: The Next Generation – you are the Captain of a small Starship with a standard crew and basic weaponry. Will you use your crew’s experience to improve your ships systems or to recruit more experienced crewmen to your ship? Will you form diplomatic relationships or conquer civilizations in battle? 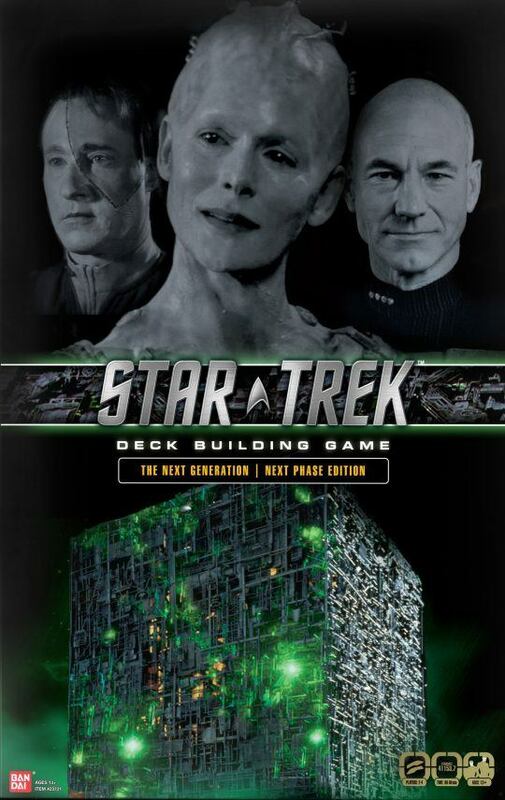 Build your deck and explore the Star Trek universe! Play these different scenarios or create your own! Explore the universe, interact with alien races, complete missions and experience the mysteries of space. Gain knowledge and power to become a legendary Captain! Team-up and determine if you are in favor of peace or war in the Alpha Quadrant! What will be the future of the Federation? “I am the Borg.” This time the Borg Queen has arrived to assimilate planet Earth! Work with your fellow players to defeat the Borg and the Queen.